For all the hubbub about Marvel Studios deciding to go with an obscure team featuring a talking raccoon with a machine gun for their latest movie, they’re only continuing on as they started. Think about it; not counting serials, what was the first DC universe character to get his own movie? Batman, followed by Superman (followed by Batman, Batman again, even more Batman, Superman, Superman and next Batman and Superman together). That’s their two biggest guns, and barring that weird Ryan Reynolds thing and Vertigo adaptations, that’s about it. What was Marvel’s first superhero to get his own theatrical movie? Howard the Duck, followed by Blade, a character who struggles to headline his own comic books, but somehow managed a trilogy of movies. Yeah, Howard the Duck was the first obvious warning sign George Lucas wasn’t perfect, but now that Guardians of the Galaxy movie doesn’t sound so weird, does it? Anyway, this is a special edition of Pull List; we’re taking a look back at one of the odder cult characters in mainstream comics. Howard the Duck got his start in a horror comic, of all places, created by weird writer extraordinaire Steve Gerber (four words: elf with a gun). Howard would have been a nobody in his home universe, where everybody is a duck, but he got stuck in our world, “trapped in a world he never made,” as the series’ tagline goes (which kind of applies to everybody, but whatever), so he got his own comic book series here. From the time of his hatching, he was … different. A potentially brilliant scholar who dreaded the structured environment of school, he educated himself in the streets, taking whatever work was available, formulating his philosophy of self from what he learned of the world about him. And then the Cosmic Axis shifted … and that world changed. Suddenly, he was stranded in a universe he could not fathom. Without warning, he became a strange fowl in an even stranger land. 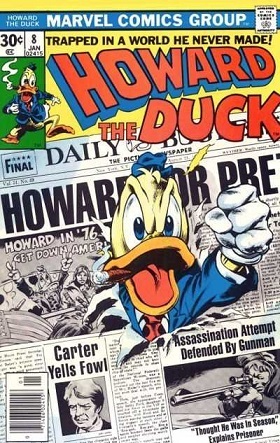 This issue’s cover has gone on to become rather iconic in certain crowds; the image of Howard raising an angry fist as he slams through a newspaper announcing “Howard for Prez” is usually the de facto depiction of the duck that doesn’t involve that crappy movie. And that headline isn’t a gimmick; in this issue, a duck named Howard really is running for president as a part of the Up All Night Party against Jimmy Carter and Gerald Ford. Sad how much of this is still relevant, really. Howard runs an “activist” campaign, telling campaign image consultants to get lost, and actively insulting major industries who want to buy him off. At one point, he’s asked how he feels about violence in comic books. “I’m all for it.” God bless America, but I’d vote for Howard in a heartbeat. Unfortunately for America, someone has manipulated a photograph to make it appear that Howard and Beverly once had a bath together, causing Howard to lose the election, which sadly makes sense. Howard follows in the great American tradition of those who have just lost an election, and goes to Canada. Turns out the entire election was a plot by Canadian super patriot Pierre Dentrifis to discredit America so Canada can annex the entire country. Pierre sends a bellhop with a robot plane to take Howard out before he can get to Canada, which tips off the local Mountie that he is behind the scheme. Bellhops and robot planes are his modus operandi, see. However, his supervillain gimmick is beavers, and Howard finds himself on a tight rope in a fight to the death with The Beaver in an effort to save Beverly, who has been kidnapped by The Beaver’s trained beavers. I feel like there is something I’m missing in this story about the giant Beaver, but I don’t get the joke. Is it dirty, or what? Howard the Duck is written for adults, and I’m not just talking about the innuendo, if you know what I mean. This issue is a primary example; there’s just not many kids who would get it, or even enjoy it. Lots of comic book fans will tell you these old Bronze or Silver or What-Have-You Age superhero comic books weren’t written for kids, despite the fact they very much were. Superhero comics for adult readers weren’t really a thing until the Eighties. It’s kind of hard to admit you’re a “fan” of children’s stories; I don’t really have that problem. I review My Little Pony sometimes. I’ve made my peace with that. 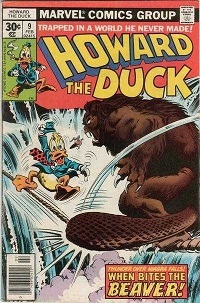 This issue is entirely told as a dream that Howard is having, immediately following his fight with The Beaver last issue. He’s having trouble reconciling his character as he’s supposed to be (a cynical loner who is only out for himself) with his character as written (basically, just another superhero, except weirder and with more jokes). 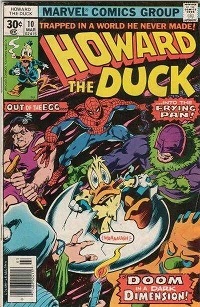 The issue is a precursor to a type of postmodern comic that would become common in the decades ahead; Howard never crosses the line and flat out admits he’s just a comic book character (he’s apparently saving that for Deadpool), but Steve Gerber here is dealing with themes that would return again and again with a certain type of comic writer (for instance, it shouldn’t come much of a surprise Grant Morrison is apparently a fan of the series). And that’s what I mean when I say the book isn’t for kids; this is still a book with the Comics Code Authority’s stamp of approval on the cover. The joke here is not that it’s dirty. The themes present in Gerber’s Howard the Duck aren’t for kids; quite frankly, they probably found an issue like this boring. This series is really one of the first mainstream comics titles specifically aimed at adults first, children second, if at all (which is today’s market). It is remarkably ahead of its time. So, thanks, George Lucas, for ruining it for us all. I’d actually been planning this article since November of last year when I found a couple back issues at a local auction; I was pleasantly surprised with Guardians of the Galaxy’s stinger. As a "kid" in the 1970s -- 14 at the time HTD #10 was published -- I actually loved Howard the Duck. I wasn't at all familiar with him until I just happened to pick up issue #4, and I can't even recall what compelled me to get as at the time I was entirely into superheroes, but I got and loved it. Even odder, I shared it with my mother (33 at the time) and she enjoyed it too. This may have just been the beginning of my tastes in comics beginning to change, so that eventually I'd even enjoy Harvey Pekar's American Splendor. At any rate, in the mid-70s Steve Gerber was perhaps my favorite comics writer, for the Defenders and Omega the Unknown as well as for Howard.